Waikiki 101: Hike Diamond Head! Discover one of the world's most amazing natural wonders at Diamond Head State Monument. Situated just minutes from Waikiki, this impressive 300,000-year-old volcanic crater invites visitors to go hiking and take in the natural beauty and untold mysteries of Hawaii. Start at the visitor center kiosk to learn more about this stunning landmark then walk up a steep and strenuous, .8-mile hiking trail to the summit. Reach the top and you'll be rewarded with breathtaking views of the saucer-shaped crater floor, lighthouse, the Koko Head coastline, and migrating whales. Enhance your experience with a self-guided audio tour that highlights the history, plants, animals and scenery along the way. Stop for a picnic before making your way back down the trail. Gates are open daily from 6am-6pm. Last entrance to hike the trail is at 4:30 pm. Gates are locked at 6pm. How long is the hike up Diamond Head? The hiking trail is is short but it can be strenuous for some visitors. It generally takes the average visitor around 45 minutes to reach the top of the trail. The trip can take longer if the trail is crowded when you visit. You'll want to allow at least 1.5-2 hours to really relax and enjoy the hike and the scenery while you're there. Feel free to stay a little longer and enjoy a picnic overlooking the crater. How much does it cost to hike Diamond Head? Entry to the visitor parking lot is $5 per car and pedestrians can enter for just $1 per person. If this is your first visit to Diamond Head, the self-guided audio tour is worth the $4 investment. It offers interesting information about the crater and highlights many points of interest during the hike. 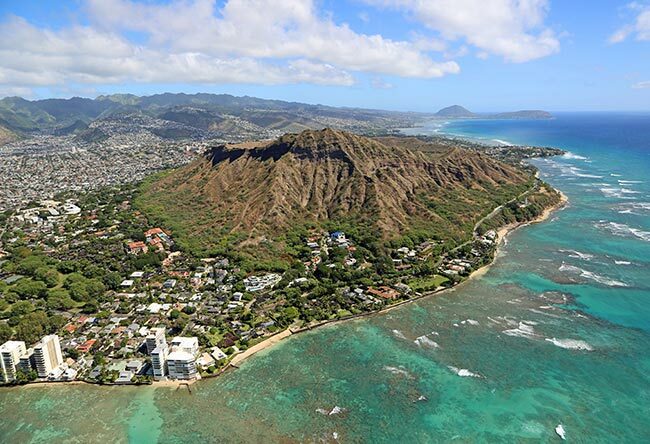 How long is the Diamond Head summit hiking trail? At just .8 miles, the trail is not long at all. Built in 1908 for Oahu's coastal defense system, the steep hiking trail rises up 560 feet as you make your way from the crater floor to the summit. Make sure to wear solid walking shoes, a hat, sunscreen, and bring plenty of water for the trip. What is the latest time I can enter? Visitors are only allowed to enter Diamond Head State Monument to hike the trail until 4:30pm. The gates are locked promptly at 6pm, so if you arrive at 4:30pm, you will only have an hour and a half to enjoy the park. It's best to arrive earlier so you can really make the most of your visit instead of rushing through it.